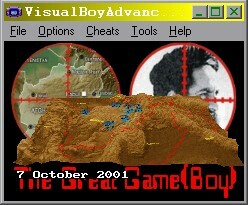 The Great Game(boy), released here for the Open Art Network, is a Nintendo Gameboy Advance game depicting munition, sortie, and troop movement data on a relief map of Afghanistan, during the US invasion of October 7 - November 24, 2001. Based on the data and software created for the project The Great Game, The Great Game(boy) is the most recent addition to the series. On this page you will find links to the downloadable binary and Gameboy emulator, the complete source code, written in C, plus links to the required resources (and reading) to create Gameboy advance games on your own. If you want to run the binary on a Mac, you need a Mac GBA emulator. use a,s,z,x, and arrow keys to navigate in the game. consult Options->Joypad->Configure in the emulator's menu to change default navigation keys. If you just want a look at the main code, without having to download the whole project, click the link on the right, open in a text editor or C/C++ IDE. If you would like to download the source, click the link to the right, unpack the zip file to an appropriate directory, maintaining the sub-structure when you unpack. This zip file includes Gba3ds, the 3d API from Torlus. If you would like to actually compile the code, and make your own 3d games on the gameboy, you will also need DevKitAdv from Sourceforge. The release on Sourceforge includes the GCC compiler, an open source C compiler. Once you have unpacked DevKitAdv and pathed to it, all you need to do to re-compile greatgame(boy) is type "make" at the command line. You need nothing more than a text editor to modify the source, though I personally use Visual C++ ver 6.0, and have included the VC++ 6.0 project files for your convenience. For complete info on authoring software for the Gameboy, consult www.devrs.com/gba and www.gbadev.org. For more info on 3d for the gameboy, consult the Gba3ds web site maintained by Torlus. Writing software for the Gameboy is some pretty heavy duty stuff but all the tools and resources for doing so are available from these links. I highly recommend you scour the Sourceforge and Devrs pages to get up and running. However, If you are at a complete loss and really, really want to do this, you can contact me and I'll try to help you out.